A storyboard with support for index cards and photos. A project manager with fast, project-wide search capabilities. Produces submission-ready manuscripts and scripts. Storyist comes with several project templates that provide style sheets for industry-standard formatting. You don’t have to set the margins, font, line spacing, or anything else; just start typing, and you can produce a submission-ready manuscript or script. But if you want to change the format, you can. Like most creative writing applications, Storyist provides a full complement of word processing tools, including spelling and grammar checking. 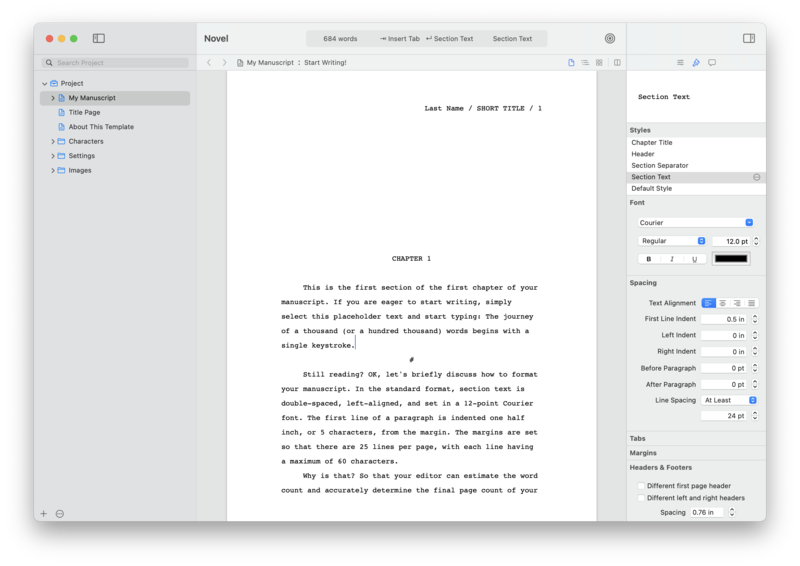 But unlike some competing apps, Storyist also provides a page layout view and support for headers, footers, and style sheets, so there is no need to export your finished draft to another word processor for final formatting. Provides a high-level view of your story. The storyboarding tools in Storyist allow you to sketch out a story using photographs and index cards and then refine it with customizable plot, character, and setting sheets. For writers who prefer a more traditional approach, Storyist provides an outliner for working with story elements in outline form. Keeps all your writing organized and accessible. The Project view lets you see your story elements at a glance and allows you to create and arrange them. The search field lets you quickly find what you’re looking for anywhere in your project and return to your writing. The Storyboard. Sometimes you want to put a face to a name. Storyist lets you cast your novel or screenplay with images from your photo collection or from the web. You can also view, edit, and arrange your scenes and plot points using virtual index cards on a cork board. 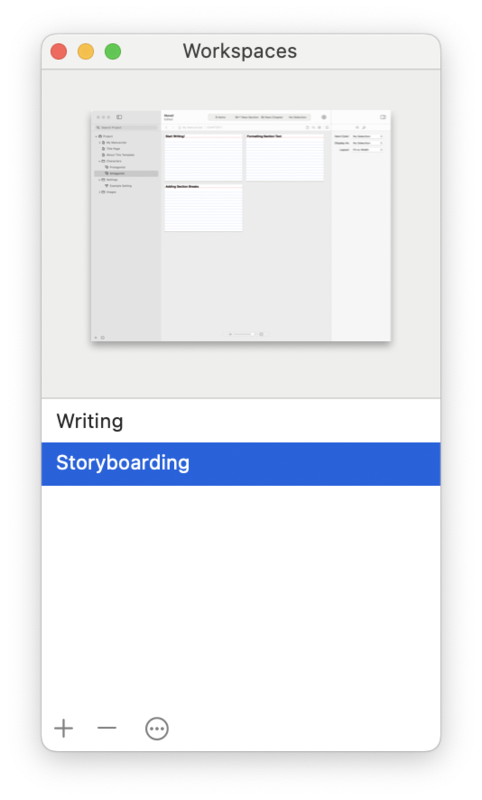 And Storyist automatically transfers your storyboard information to story sheets for in-depth development. The Outliner. A flexible outlining tool lets you display and edit not only your section or scene summaries, but also your plot, character, and setting notes. Customizable story sheets. Story sheets are editable forms tailored for novel writing and screenwriting. You use them to record information about various aspects of your story, such as a character’s age or a description of a setting. Storyist comes with story sheets for plot, character, setting, and section/scene. And story sheets are customizable, so you can capture the information you want to capture. Project-wide search. As you develop your story, your page count grows, and so does your collection of notes about your story—plot, character, and setting notes. Wouldn’t it be nice to be able to quickly find what you’ve written when you need it? With Storyist, you can. The search field helps you quickly find the information you are looking for. Full-screen Editing. Want to remove the distractions and focus on your writing? The full-screen editing mode puts the whole screen at your disposal, turning your computer into a dedicated writing environment. Wiki linking. Your notes become much more valuable when you can describe the relationships between them with links. Using a simple Wiki syntax, you can quickly create links to any item in your project, and even create the items themselves. And when you do, Storyist maintains your links for you. If you change the title of a notebook entry, the titles of any links to it update automatically. If you move a plot point to a new section, plot point links in your Section Sheets adjust accordingly. Smart text. In screenplay mode, Storyist collects your scene introductions, locations, times, character names, and transitions as you type and auto-completes them for you when you need them. Quick styles. Tab and Return key shortcuts make changing between novel or screenplay elements as simple as typing a key or two. And with shortcuts for all of the styles in your style sheet, you can focus on writing, not formatting. Open the App Store app in your Applications folder. Click the Search field, locate Storyist, and open the Storyist page. Storyist 4 is a free download. 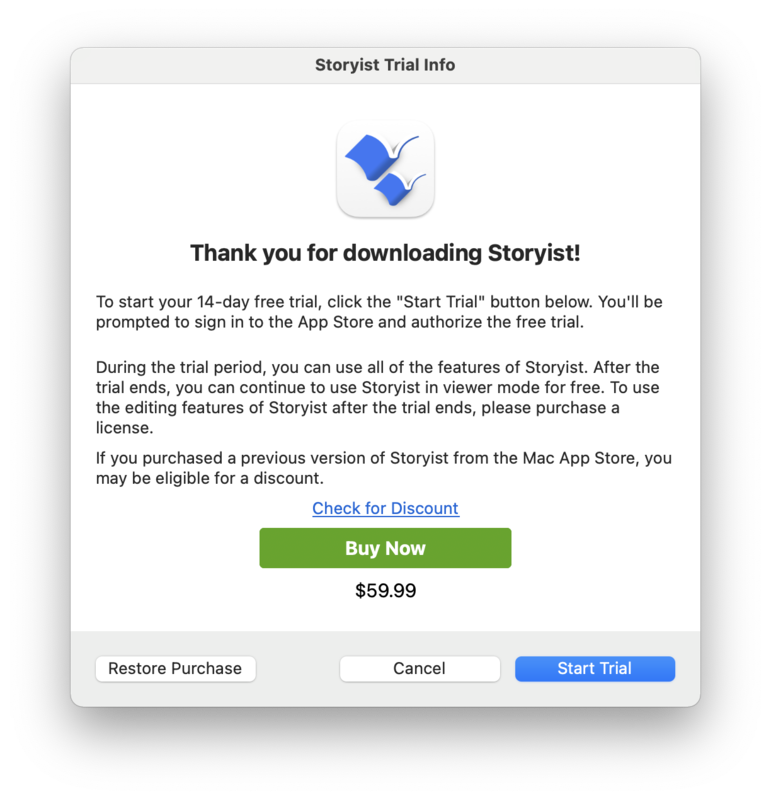 When you first run the app, a dialog appears giving you the option of starting a free trial, purchasing a license, or running in Viewer mode. Log in to the App Store if prompted. You can also choose to use the app in Viewer mode instead of starting the trial. Viewer mode allows read-only access to Storyist projects, and you can export or copy text from it. After the free trial concludes, you can continue using the app in Viewer mode for free. 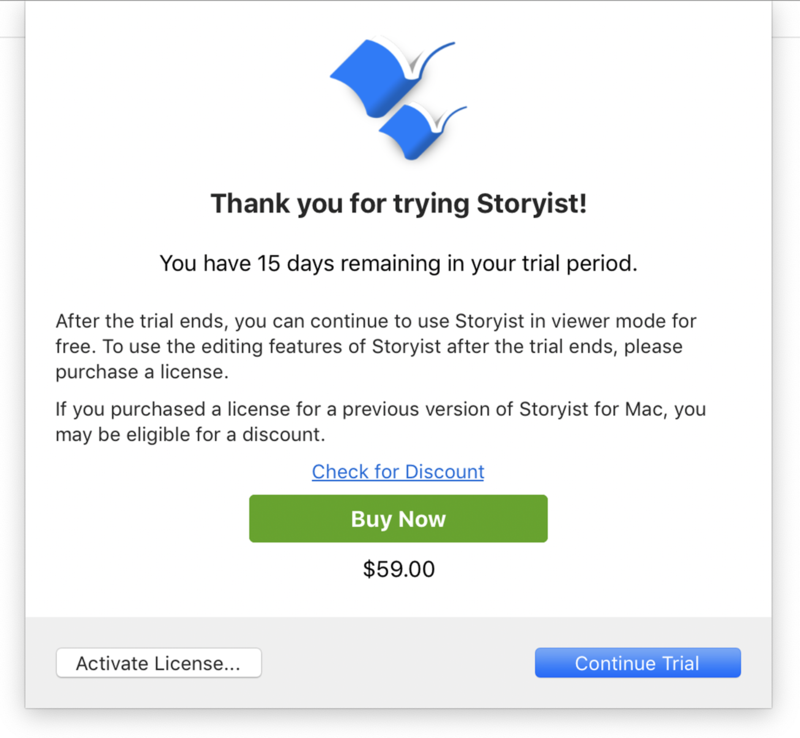 To use the editing features of Storyist after the trial ends, please purchase a license by clicking the Buy Button and following the prompts. After you complete the purchase, the app is unlocked automatically. Visit http://www.storyist.com/downloads and download the latest version of Storyist. Locate the file named “Storyist.dmg” or “Storyist-<x.y.z>.dmg” (where x.y.z is the current version number) in your downloads folder. Double-click the file. macOS will decompress the file and make it available (mount it) in the Finder. Drag the Storyist icon to the Applications folder or a folder of your choosing. When you first run the app, your free trial starts automatically. A dialog appears giving you the option of continuing the trial or purchasing a license. Install Storyist from the Storyist website as described above. When the Trial dialog appears, click the Activate License button. Storyist can use your Internet connection (when active) to check automatically for updated versions. Automatically updating your software is recommended for all users, because it allows you to keep current with the latest features. From the main menu, choose Storyist > Preferences. Click the “Check for updates” pop-up menu and choose the frequency for checking. You have the option of sending your system information to Storyist Support when you check for updates. By sending your system information, you encourage better support for your system configuration in future releases. The information sent is anonymous and is not associated with your name or any other personal information. To see the type of information that is sent, click the Learn More button. The Project View—Displays the files and folders associated with your project. The Main View—Provides an area for editing project files. The Main view can be configured to display files as text, outlines, or storyboards. It can also be split so you can see multiple project items at the same time. The Inspector—Provides setup and formatting controls for selected files. The Toolbar—Provides buttons for setting up the Storyist window, adding files and folders to the project, viewing writing goals. It also provides a context-sensitive status bar. A Storyist project can contain text files, story sheets, folders, images, and bookmarks. The Project View—located to the left of the main window—helps you organize and access these items quickly. To hide the Project View, choose View > Hide Project View. To display it again, choose View > Show Project View. The navigation bar—The button strip at the top of the view. 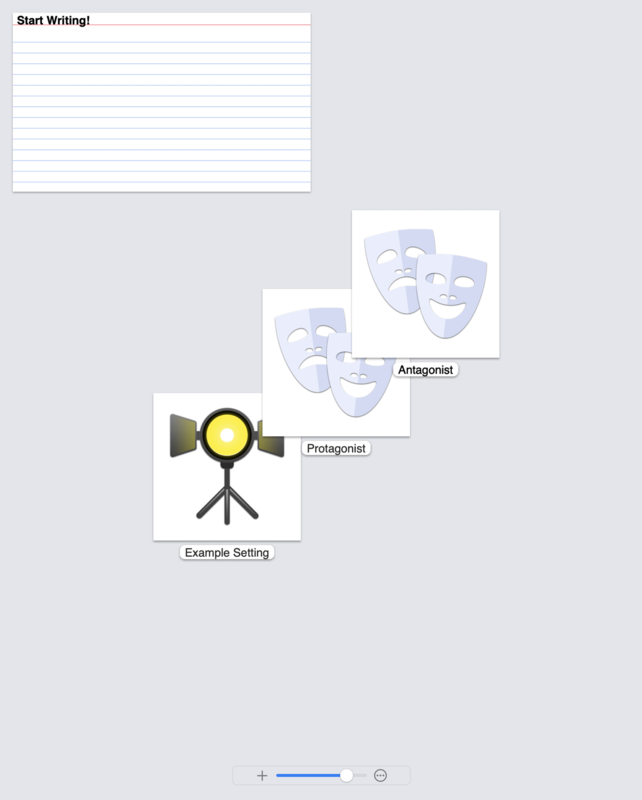 The editing area—The area in the middle of the view, which you can set up to be a text view, an outline view, or a storyboard view. Much like a web browser, the navigation bar lets you switch between recently viewed pages. It also controls whether the content of the view is displayed using the Text view, the Outline view, or the Storyboard view. Back Button—Returns you to the previous item in your viewing history. Forward Button—Takes you to the next item in your viewing history. File Pop-up Menu—Pops up the list of files and folders in your project. Outline Pop-up Menu—Pops up the outline of your text file, allowing you to navigate to sections of your text. View as Text Button—Switches the editing area to the Text view. View as Outline Button—Switches the editing area to the Outline view. View as Storyboard Button—Switches the editing area to the Storyboard view. The Text view is where you’ll do most of your writing. It displays your text files and story sheets in text form. Choose View > as Text. Click the View as Text button (the first button on the right) in the Navigation bar. The outline view provides traditional outlining tools that let you quickly capture your ideas and work with them at a high level. Choose View > as Outline. Click the View as Outline button (the second button showing three staggered horizontal lines) in the Navigation bar. The storyboard view gives you a high-level overview of your text files, folders, and story elements (characters, plot points, and settings) by displaying them as index cards or photographs on a corkboard or collage. Choose View > as Storyboard. Click the View as Storyboard button in the Navigation bar (the right-most button). Headings and groups are shown as items on a corkboard. Body text and individual story elements are shown in a collage. The Storyist toolbar provides buttons for setting up the Storyist window and a status bar that shows information about the current cursor selection. The default toolbar configuration is shown below. View—Provides a quick way to show or hide the Project view or the project trash. It also lets you split the editor either horizontally or vertically. Add—Provides a quick way to add text files, story sheets or folders to your project. Goals—Opens the writing goals popover. Inspector—Opens or closes the Inspector. When you create a new document, Storyist displays a dialog to allow you to choose a template for your project. The Workspaces window lets you create and quickly switch between snapshots of your project views and windows. To view the Workspaces window, choose Window > Workspaces > Manage Workspaces. The Inspector view allows you to quickly view and edit settings and formatting information. From the toolbar, click the Inspector button. From the main menu, choose View > Show Inspector. Each type of project item has its own inspector. The project and text inspectors are shown below. Save a version (backup) of the project. Remove selected versions from the versions repository. Restore the project state from a previous version. Open a copy of a previous version for viewing. To view the Versions Window, choose File > Show Previous Versions. Note: The Versions Window is not available until you’ve saved your project. Versions are stored on your Mac, and if you’ve enabled Time Machine, on your backup drive. 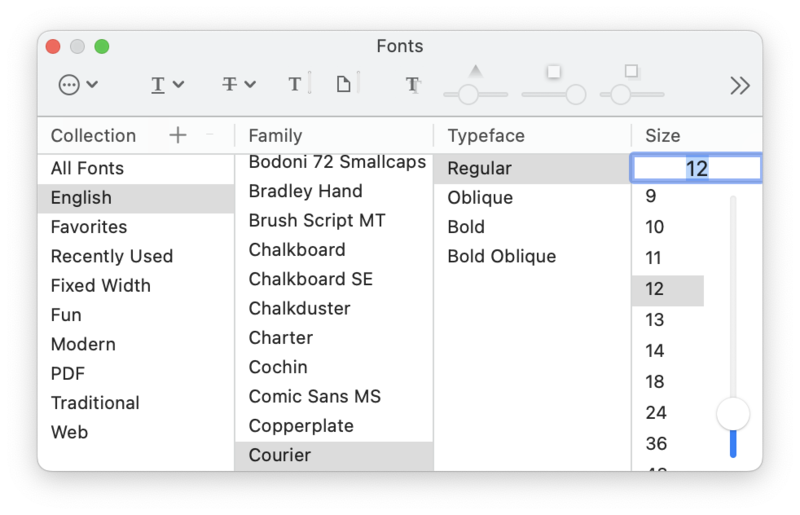 You can use the macOS Fonts window to change font attributes such as typeface, size, color, underlining, and strikethrough. To view the Fonts window, choose Format > Font > Show Fonts. 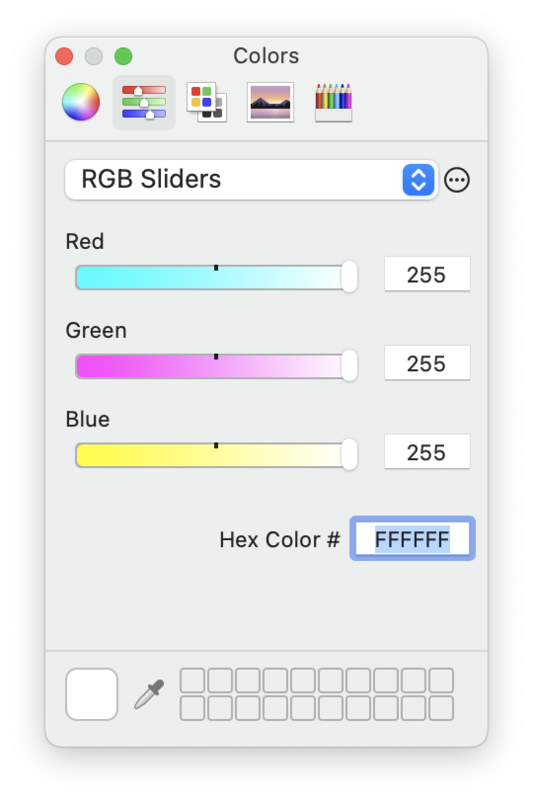 Open the Inspector, select the Text Inspector tab, and click the color well in the Size and Color section. The General Preferences Pane lets you specify which template to use for new documents. The behavior of the Tab and Return keys. Storyist can use these keys as shortcut keys to make changing styles as simple as typing a key or two. Small snippets of text you can insert in your text files using the tab key. The Appearance Preferences pane lets you customize the fonts, colors, and icons used in the application. Many of the Storyist menu commands described in this user’s guide can be performed from the keyboard. To see a list of the available shortcuts, open Storyist and choose Help > Storyist Help, and click on the Keyboard Shortcuts link. Some menu commands are also available from shortcut menus. To bring up a Shortcut menu, right-click or control-click an object or some selected text. A Storyist project contains your text files, story sheets, folders, and images. Introductory text for various project types. 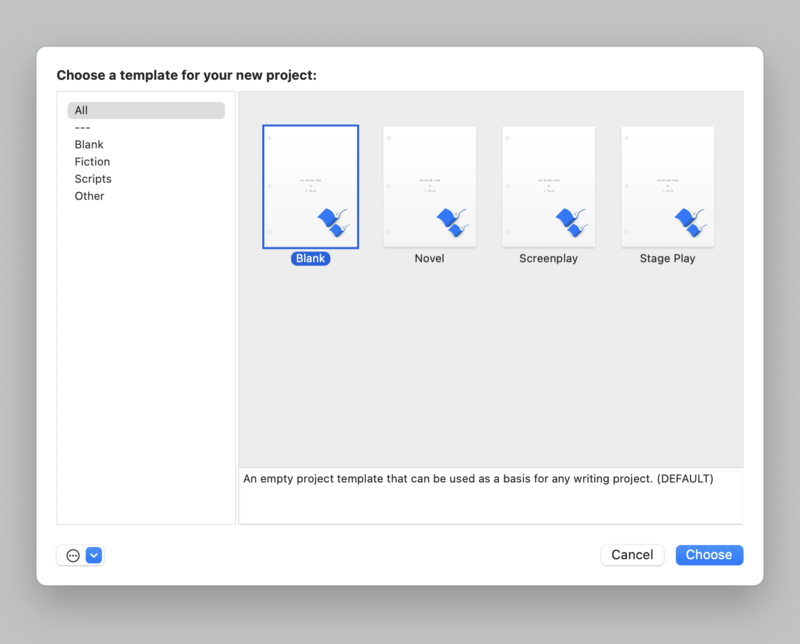 Storyist comes with several built-in templates that you can use as starting points for a new project: Novel, Screenplay, Stage Play, and Blank. A manuscript with style definitions that make it easy to format your novel in a standard format. The placeholder text includes a brief introduction to manuscript formatting to give you a sense of what the formatting looks like. A title page to include with your manuscript submissions. Several example character and setting sheets that you can use or replace as needed. If you want to write a novel and aren’t sure which template to use, select the Novel template. A script with style definitions that make it easy to format your screenplay in a standard format. A title page to include with your submissions. If you want to write a script or screenplay and aren’t sure which template to use, choose this one. Style definitions that make it easy to format your stage play in a standard format. A brief introduction to stage play formatting to give you a sense of what the formatting looks like. A title page to include with your script submissions. Example front matter to include with your script submissions. Blank—This template provides a starting point for a project of any type. It includes empty folders to hold text files and images. To add text files, story sheets, or additional folders to the project, click the Add button in the toolbar. Open the Preferences window by choosing Storyist > Preferences. Click the General preference pane, if it is not already selected. Click the Choose button and click the template you want to set as the default. Rich Text Format (.rtf)—Storyist imports text, formatting information, headers, footers, and style sheets. Use this format if possible. Rich Text with Attachments (.rtfd)—Storyist imports text, images, and formatting information. Microsoft Word (.doc)—Storyist imports text and formatting information. Microsoft Word (.docx)—Storyist imports text and formatting information. Open Document Text (.odt)—Storyist imports text and formatting information. HTML (.html)—Storyist imports text and formatting information. Text Only (.txt)—Storyist imports text information. Final Draft Converter Format (.fcf)—This format is used by Final Draft®, a screenplay formatter published by Final Draft, Inc. Storyist imports text and screenplay element information. Final Draft XML Format (.fdx)—This format is the default file format for Final Draft version 8. Storyist imports script text, script notes, and screenplay element information. 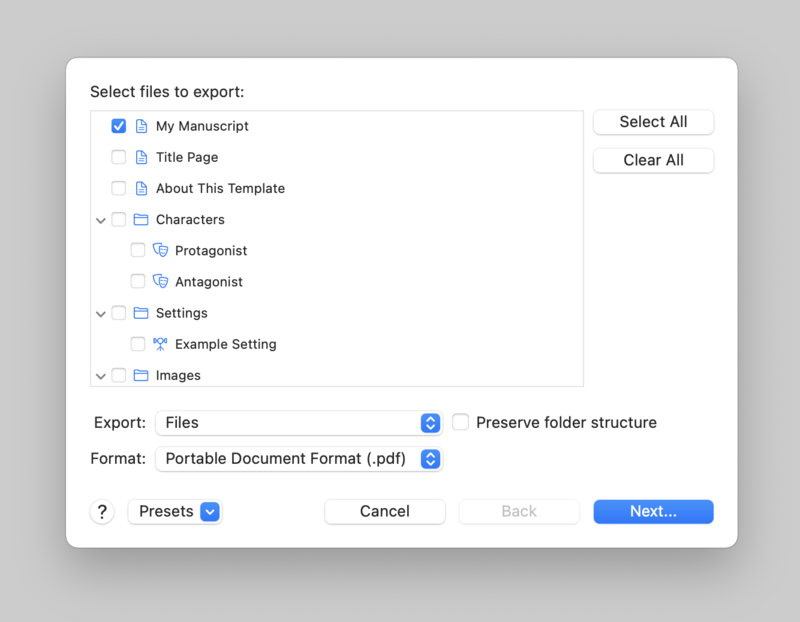 Scrivener Format (.scriv)—Storyist import text and formatting information, comments, index card summaries, style sheets, and project structure. Fountain Format (.fountain)—Fountain is a markup syntax for writing screenplays in plain text. Storyist imports formatted script text, comments, and index card information. Note: While some word processors do not store their files natively in the above formats, most do allow you to export your file into them. Refer to the word processor’s manual for details. Select a file in one of the formats listed above. Note: You can also import a file simply by dragging to the Project view (on the left of the window) or to a folder in the Main view. Your manuscript (or script) and notes are available from the Project view located at the left of the main window. To view a file or folder listed in the Project view, simply click it. Click the Forward or Back button in the Navigation bar in the Main view until you see the page you are looking for. Click the Navigation bar pop-up menu and select the page you are looking for. Choose View > Go Forward or View > Go Back until you see the page you are looking for. You can change text appearance and size using the Format > Font menu, the Fonts window, or the Inspector. The Format > Font menu offers basic formatting commands like Bold, Italic, and Underline that control the font weight and style, as well as commands to make text bigger or smaller. Most commands in this menu are assigned shortcut keys and can be invoked from the keyboard. The Fonts window offers more precise control over font family, typeface, and size selection. In addition, it offers controls for changing text color and adding underlining, strikethrough, and shadow. To open the Fonts window, choose Format > Font > Show Fonts. The typeface you select determines the font weight and style. For instance, selecting the Oblique typeface in the Helvetica family provides italicized Helvetica. Similarly, selecting the Bold Oblique typeface provides a Helvetica font that is both bold and italic. The Inspector’s Format pane offers control over font family, typeface, size, and color selection. To open the Format pane in the Inspector, choose View > Inspector > Format. Note: In some parts of the user interface, text appearance and size is determined by the program and are instead controlled by the Appearance tab of the Preferences window. Examples include the summary field in story sheets, text in the Outline view, and text in index cards. You can change the text alignment and spacing by using the Format > Text menu, or by using the Inspector. The Format > Text menu offers the frequently used alignment commands Align Left, Center, Align Right, and Justify, as well as commands for copying Ruler settings. Like the Format > Font menu, most commands are assigned shortcut keys and can be invoked from the keyboard. Click your cursor in the text that you want to format. From the main menu, choose Format > Text. Choose Align Left, Center, Justify, or Align Right. Select the Spacing section of the Format pane. Click the Align Left, Center, Align Right, or Justify segment of the Alignment button, as appropriate. Choose View > Show Rulers. The rulers appear, showing the indentation and tab stop settings for the current selection. To change existing tab stop locations, drag them to the desired position. To add additional tab stops, click the location in the ruler where you want the tab stop to appear. Select the Tabs section of the Format pane. To change existing tab stops, double-click the desired stop and enter a new value. To add additional tab stops, click the Add button (+), double-click the new stop, and enter the desired value. You can choose the type of the tab stop (left, center, right, or decimal) by selecting the corresponding value in the Alignment column. You can also set a default tab interval. Tabs after the last tab specified in “Tab Stops” are placed this distance from the previous tab. A value of zero causes tabs after the last tab specified in “Tab Stops” to move to the next line. Edit the appropriate body text style so that the first-line indent field has a value of zero. Add the appropriate tab stop to your styles, as described above. Select the Text Editing pane. Uncheck the “Enable Tab key shortcuts” checkbox. The Margins section of the Format pane of the Inspector allows you to set page margins and specify that page margins be mirrored (used when laying out facing pages of a book to be printed). Open the Inspector and select the Margins section in the Format pane. Make the desired top, bottom, left, and right margin changes. You can choose View > Show Page Guides to see where the margins are located. Click the Mirror Pages checkbox. Editing a header or footer is as simple as placing the cursor in the header or footer area and typing your text. Click in the header or footer you want to edit. You can choose View > Show Page Guides to see where the header and footer areas are located. All standard formatting features—including styles—are available in headers and footers. Place the insertion point at the location where you want to insert a page number. Note: If you type a number in the header instead of inserting an auto-incrementing page number field as described above, that number will appear in the header or footer on all pages. You can change the location of the headers and footers from the Headers & Footers section of the Format pane of the Inspector. Open the Inspector and select the Format pane. Locate the Headers & Footers section. Click the “Left and right headers are different” checkbox or the “Left and right footers are different” checkbox, as appropriate. Make the desired header and footer spacing changes. You can use the Show Page Guides command in the View menu to see where the margins are located. Once you become comfortable with the menu commands, you might want to use keyboard shortcuts for some commands instead. A full listing of keyboard shortcuts can be displayed in a Help Viewer window. To see them, choose Help > Storyist Help, and click the Keyboard Shortcuts link. A style is a named collection of character and text formatting settings. Each Storyist template provides a group of styles, called a style sheet, which can be used to format your document quickly and consistently. Note: Storyist provides support for paragraph styles; that is, styles that apply to an entire paragraph. Open the Format pane of the Inspector and select the style you want to apply from the list of styles. From the main menu, choose Format > Style > Apply Style and choose the style you want to apply. Control-click or right-click the selected text, choose Style > Apply Style from the pop-up menu, and select the style you want to apply. Select some text containing the style you want to base your new style on. Click the disclosure (triangle) button of the selected style. A menu appears. Choose Create New Style From Selection. A dialog box appears. Type the name for the new style and optionally click “Apply this new style on creation” to apply the style to the selected text. Select the text containing the style you want to base your new style on. From the main menu, choose Format > Style > Create New Style From Selection and follow steps 5 and 6 above. Click the disclosure (triangle) button of the style you want to delete. A menu appears. If the style you have chosen is in use in the document, a dialog appears, asking you to choose a replacement style to apply to the affected text. From the main menu, choose Format > Style > Delete Style > <style name>. If the style you have chosen is in use in the document, a dialog appears, asking you to choose a replacement style to apply to the affected text. Click the disclosure (triangle) button of the style you want to rename. A pull-down menu appears. Choose Edit Style. A dialog box appears. Type the new name in the Style Name field. Click the disclosure (triangle) button of the style you want to edit. A menu appears. A dialog appears, allowing you to edit the following properties: Style, Font, Spacing, Tabs, and Pagination. Style Name—The name of the style. Based on—The parent style of the style. Styles inherit the formatting properties of their parents. Next Style—The style applied to a paragraph that is created when you press the Return key at the end of a paragraph. Outline Level—The outline or heading level for the style. This value controls the outline level in the project view and in the outline view. Tab Style—The style that is applied when you press the Tab key at the start of an empty paragraph. Family—The general name given to a collection of related fonts (that is, the font family). Examples of family names include Courier, Times New Roman, and Arial. Typeface—The name given to a specific font, which together with the family name specifies a font. Example typefaces include Regular, Bold, and Oblique. Size—The point size of the font. Color—The text or foreground color of the font. Underline—The underlining setting for the font. Available values are None, Single, and Double. None—Text displays as it is typed. The spacing properties define the alignment, indentation, and space between paragraphs. Text Alignment—Controls whether paragraph text is displayed left aligned, centered, right aligned, or justified. Left Indent—Sets the text indentation from the left margin of all lines of a paragraph except the first line. Right Indent—Sets the text indentation from the right margin. Note that positive values indicate offsets from the left margin, while negative values indicate offsets from the right margin. First Line Indent—Sets the text indentation of the first line of a paragraph from the left margin. Before Paragraph—Sets the space before the paragraph. After Paragraph—Sets the space after the paragraph. 1.5 Lines—Lines are spaced by one and a half times the single-spaced values. Double—Lines are double-spaced; that is, the spacing is twice the value of the single-spaced text. At Least—Lines are spaced by at least the amount indicated in the text field that follows the pop-up menu. If the height of one or more characters in a line exceeds this minimum value, the space between the lines increases to accommodate the tallest character. Exactly—Lines are spaced by exactly the amount indicated in the text field that follows the pop-up menu. If the height of one or more characters in a line exceeds this minimum value, the following line may overwrite portions of the character. Multiple—Lines are spaced by a multiple of the amount indicated in the text field that follows the pop-up menu. For example, setting the pop-up menu to this value and entering 2.5 in the following text field causes the lines to be spaced by two and a half times the amount of single-spaced text. Note: The spacing values display in the default measurement units for your Mac. You can change the default measurement units from the System Preferences window. Default—Sets the default tab interval. Tabs after the last tab specified in “Tab Stops” are placed this distance from the previous tab. Note—A value of zero causes tabs after the last tab specified in “Tab Stops” to move to the next line. Left—Specifies a left-aligned tab stop. Center—Specifies a center-aligned tab stop. Right—Specifies a right-aligned tab stop. Decimal—Specifies a tab stop aligned on a decimal point. The pagination properties define how text is laid out on the page. Paginate As—Specifies the “pagination mode” of the style. Values other than Normal are used only in screenplay formatting and override the other pagination options. Paragraph starts on a new page—A page break occurs before paragraphs having this style. Keep with next paragraph—A paragraph displays on the same page as the paragraph that follows it. This option is useful for headings. Avoid widow and orphan lines—Paragraphs that have a single line at the top of a page (a widow) or the bottom of a page (an orphan) move to the next page. Storyist can import styles from other Storyist documents or from RTF files that include styles. Choose Format > Style > Import Styles. An Open dialog appears. Select the file containing the styles you want to import and click Open. A list of styles available in the selected file appears. If you want to overwrite styles in your project with styles of the same name in the import file, check “Replace duplicate styles.” If you don’t check this option, styles with the same name are imported with a unique name. Note that while many RTF files contain styles, some (those created by TextEdit, for example) do not. One of the most helpful features that Storyist provides is the ability to create links. You can link from your Storyist project to locations on the Web so you can have quick access to external information, or you can create links within your project to connect internal elements to each other. Place the insertion point at the location in the text where you want to insert a link. From the main menu, choose Edit > Insert > Link. A dialog box appears. From the Link To pull-down menu at the top of the box, choose Story Element. The Title box appears. Select the element you want to link to. If you want Storyist to update the link text when the element title changes, click the checkbox labeled “Keep display value in sync with title.” If you want to provide link text different from the element title, deselect the option and enter your link text in the Display field. Click Insert. The selected text turns blue, with an underline, indicating that the link has been created. Choose Insert > Link from the Edit menu. The Link To pop-up menu appears. Enter the Web page URL and the link text you want to display. Place the insertion point at the location in your text where you want the link to appear. Type two open brackets ( “[[“ ). Type the title or name of the story element you want to link to (or the URL of the Web page). If you want the link text to be something other than the title or URL, type a “|” character followed by the link text. Type two close brackets (“]]”). The brackets and title are replaced with your link. Select the text of the link you want to edit. Choose Insert > Link from the Edit menu. A dialog appears. Edit the link information as described in “Creating an Internal Link” or “Creating an External Link,” as appropriate. Click Insert. The new link text appears on your screen. Control-click the link you want to edit. A context menu appears. Choose Edit Link. A dialog box appears. Enter the new link information. Click Insert. The edited link appears in the text. Insert your cursor either directly before or directly after the link you want to edit. Use the arrow keys to move into the title of the link. Notice that a blue focus ring appears around the link and that the underline is gone. Type the new link title. Control-click the link you want to remove. From the Shortcut menu, choose Remove Link. You can add new elements (chapters, sections, or scenes) to your text at any time. 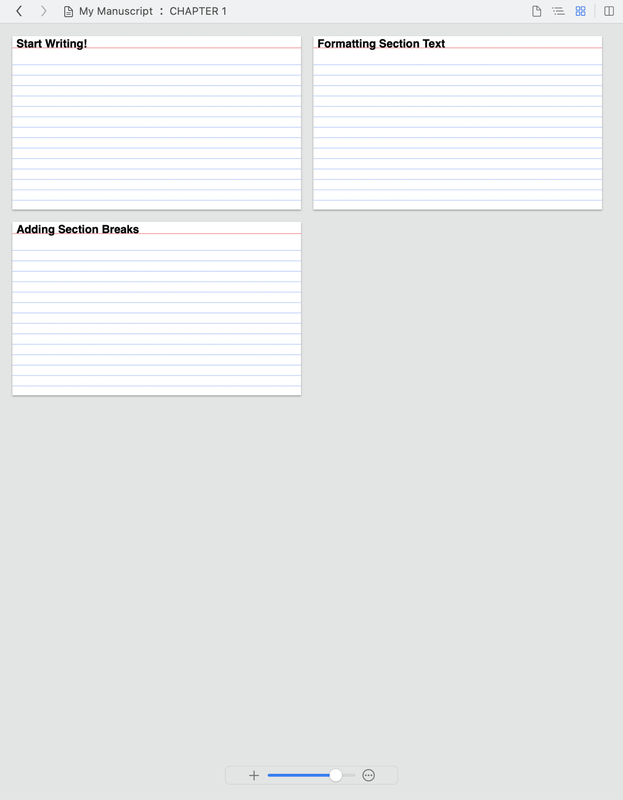 These new additions automatically generate new index cards in the storyboard and new entries in the outline. Place the insertion point at the point where you want to insert a new element. Apply the style that corresponds to the element you want to add (for example, Chapter Title or Scene Heading). See the section titled “Creating and Applying Styles” for more information on styles. As you are writing, you might want to make notes (comments) on specific paragraphs or sentences for later revision. Place the cursor before or after the text you want to comment on. Choose Edit > Insert > Comment. A comment window (a small window resembling a sticky note) appears. Type your comment into the window. To close the comment window, press the Escape (esc) key or click in an area outside the comment window. A comment icon appears to indicate that a comment is attached to the current location. To edit the comment, click the comment icon. The comment window appears, allowing you to modify the comment text. If you frequently access the same location in your file (for example, a scene that needs revising), you can bookmark it so that you can get back to it quickly in the future. Place the cursor in the text at the location you want to create a bookmark. Choose Edit > Insert > Bookmark. A newly created bookmark appears in the Project view. Type a label to identify the bookmark. Expand the Bookmark folder in the Project view. Click the bookmark item representing the desired location. The bookmarked location is displayed in the Main view. A section/scene sheet is a story sheet that contains your notes on a section of your manuscript or a scene in your screenplay. The Synopsis area holds your summary of the section. POV Character—This character field identifies the point-of-view character (or characters) in the section. Try this: Place the cursor in the POV character field and type “Pro.” Notice that Storyist auto-completes the character named “Protagonist.” Now type a new character name and press return. Notice that Storyist has created a new character and set up a link to the character’s page. Setting—This is a setting field for tracking the location(s) in which the section takes place. Conflict—This is a text field for a brief note on the central conflict occurring in the section. The Section Notes field holds any additional notes on the section you want to make. This summary section is used for entering a high-level summary of the character. This summary is displayed in the sheet itself and also in the Outline view and in the Storyboard view. This section provides context-sensitive fields for you to describe the physical aspects of the character. You can add or replace fields by clicking the field name and selecting from the menu that pops up. Many writers like to track a character’s “arc” through the story. This section allows you to specify the points along the arc where your characters learn and grow (or not). To create a new character development point, click the character icon and select Add Character Point. When you know where in your manuscript this arc occurs, right-click the section link to assign it to the appropriate section. The Notes section can be used to record additional character information. This sheet, like all story sheets, has a section for entering a high-level summary of the story element. This summary is displayed in the sheet itself and also in the Outline view and in the Storyboard view. This area allows you to assign a plot point to the section sheet for the section of the manuscript where the plot point occurs. Depending on your writing style, you may want to assign the plot point to a section as you are writing, or wait until you’ve fleshed out your various plot threads to make the assignment. In either case, you can assign the plot point to a section by control-clicking or right-clicking the Unassigned link and selecting the appropriate section. This section provides context-sensitive fields for you to describe the details of the plot point. You can add or replace fields by clicking the field name and selecting from the menu that pops up. The notes section can be used to record additional plot notes. This summary is displayed in the sheet itself and also in the Outline view and in the Storyboard view. The Setting Details section allows you to record specific details about the setting. Feel free to edit the fields to suit your needs. Note that any fields in the setting sheet are also available in the storyboard. The Notes section can be used to record additional setting notes. Each story sheet provides a set of default fields you can use to record information about a story element. In a character story sheet, for example, the default fields are Age, Gender, Eye Color, Hair Color, and Build. Want to customize the default set? You can add, rename, and delete fields. You can even add your own fields to a story sheet to track the information you want to track. Click a field label (for example, “Age:”). A menu appears. Choose a field to add from the Add Field submenu. Click the field name that you want to change. A pop-up menu appears. Choose Rename Field. A dialog appears. Enter the new field name in the Label: field. You can select a field type from the list or just leave it as Text. You can also add a comment to describe the new field. Click OK. The field is renamed. Click the field name you want to remove. A pop-up menu appears. Choose Delete. The field disappears from the story sheet. (The field data remains in your project, however. If you add the field back to the sheet as described above, the data reappears). Click an existing field name. A pop-up menu appears. Choose Add Field > Custom. A dialog appears. Enter the name of the new field in the Label: field and click “Add Custom Field.” The new field appears on your story sheet. After you’ve customized the fields on a story sheet, you may want to save the list as a template for other sheets of the same type. Click one of the fields in the list that you want to save as a template. A dialog box appears. The next time you create a story sheet of the same type, your list of fields is used in place of the default list. The template applies only to new story sheets of the same type. Any sheets you have already customized are not affected. You can add images to your story sheets. For example, you might imagine a particular actor starring as your protagonist. Storyist allows you to import an image of the actor into the Character sheet for that character. The image appears both on the Character sheet and on the corkboard for all the characters. Open the sheet to which you want to add an image. Select the image you want to add in the Finder. Drag the image to the image box (for example, the drama masks on the character sheet) and release the mouse. Storyist lets you work with your project items (manuscripts, scripts, notebook entries, and story elements) in outline form. Click the View as Outline button in the navigation bar. You can add items to an outline using the Action button or the keyboard. Select the outline row where you want to insert an item. Click the Action button in the command bar at the bottom of the Outline view. A shortcut menu appears. Choose Add from the shortcut menu, and choose the item you want to add from the submenu that appears. The item appears in the row after the currently-selected row at the outline level appropriate for the item. Press Command-Return to add a default body text or story element item. Press Command-Slash (/) to add a default heading or group. The default body text item is that which is specified as the body level style in the outline definition (for example, the Section style) and the default story element is that which is specified as the preferred contents of the enclosing folder. To see exactly which items will be added by the keyboard shortcuts, click the Action button and view the Add menu items. You can rearrange your outline by simply dragging items to a new location. 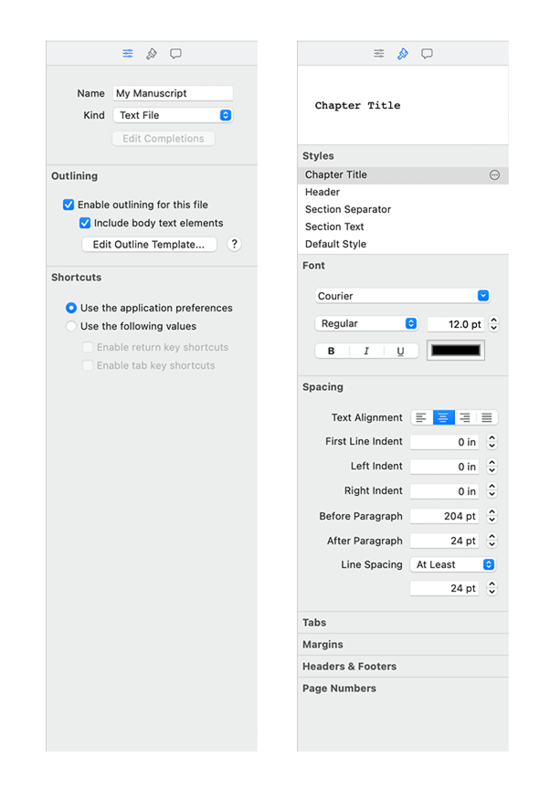 When you add an outline element to a text file (for example, a chapter to a manuscript), Storyist uses the file’s outline template to determine the appropriate style to apply. This way, headings are formatted correctly when you switch back to the Text View. Open the Inspector and select the File Info pane. Click the Edit Outline Template button. A window appears. To change a level name, double-click the name and type a new name. To change the default style for this level, select a style from the list of available styles in the Default Style pop up. To define a new outline level, click the Add (+) button and enter the desired properties. Note: Outline level properties are created in order: body text first, then outline levels 1-9. The Add button is only enabled if Storyist finds a style for the next outline level (that is, a style with the outline level set to the next available outline level). View and edit your story elements (sections, scenes, plot points, characters, settings, and notebook entries) as index cards and photos on a corkboard. Specify the details of and the relationships between story elements as a collage on a virtual desktop. You might use storyboards at the start of your project to get all your ideas down and organized before you start writing, or after you’ve completed a draft, to summarize and view the arc of your plot or characters. Corkboards—Used for folders or heading-level text items (like chapters or acts). A Corkboard is a virtual bulletin board you can use to see the structure of your story. Collages—Used for individual items (like a section or a scene). A collage helps gather the items related to the section or scene you are currently working on to keep them close at hand. These items can be images, comments, or other story elements. Click the View as Storyboard button in the top right corner of the navigation bar. Choose View > as Storyboard from the main menu. Click the plus sign in the control bar at the bottom of the editor and choose the item you want to add from the submenu. Drag a file or image to the storyboard from the Finder or another application. Some writers find it useful to set up a fixed-size corkboard so that they can visualize the act breaks of their story as they are writing. For example, if you are writing a screenplay and are planning to have approximately 60 two-minute scenes, you might arrange your corkboard to have four rows of 15 scenes (one row for the first and third act and two rows for the second act). Click the Action button. A pop-up menu appears. Fit Width—The corkboard lays out the items so that they fit in the width of the view. If you resize the view, the storyboard automatically adjusts the layout. 3 Across—The corkboard lays out the items in rows of 3 columns. 4 Across—The corkboard lays out the items in rows of 4 columns. 6 Across—The corkboard lays out the items in rows of 6 columns. Other—Brings up a dialog that allows you to specify how many columns the storyboard should use. In the example above, you would enter 15. Adding items to a collage is a simple as dragging them from the Project view to the collage. You can arrange the items in the collage by dragging them to the desired location. When you drag section or scene sheets to the collage for a section or scene, Storyist displays a dialog offering to attach the sheet to the section or scene. If you choose to attach a sheet to a section or scene, Storyist transfers the title and synopsis from the sheet to the index card and keeps the titles and summaries synchronized so that update to the title or summary of one will be reflected in the other. Attaching sheets in this manner reduces the overhead of keeping per-section or per-scene notes. Choose this option if the sheet you are attaching describes the section or scene you are attaching it to. If you choose not to attach the sheet to the section or scene, Storyist will add the sheet to the storyboard, but keep the titles and summaries separate. Choose this option if you simply want to have quick access to a sheet for another section or scene. If you have ideas for scenes, you can create sheets for them, and develop the scenes before you start writing. Then, when you understand where in the story your scenes belong, you can drag the sheets to the scene’s collage and attach the sheet to the scene. Your notes are then transferred to the scene’s index card. Once you attach a sheet to a section or scene, and any changes you make to the scene’s card will be reflected in the sheet. Similarly, any changes you make to the sheet will be reflected in the scene’s card, freeing you to focus on writing. If you later decide that a section or scene no longer meets your original goals, you can detach the sheet from the scene (by deleting it from the collage) and optionally attach it to another scene. Drag the slider in the control bar. Choose View > Zoom, and choose your option from the pop-up menu that appears. Zoom In—Enlarges the Storyboard items. Zoom Out—Shrinks the Storyboard items. Actual Size—Zooms to the largest size available for the storyboard item. Fit Width—Adjusts the zoom factor so that the view fills the width of the view with one Storyboard item. Fit Page adjusts the zoom factor so that all of the selected items fit in the view. If you are working with a collage, you can also adjust the size of individual items. Select the item you want to resize. Click and drag one of the six resize handles that appear along the edges of the selected item. Dragging a resize handle preserves the aspect ratio of an item by changing both the height and the width of the item simultaneously. Holding down the Option key while dragging allows you to change the height and width independently. 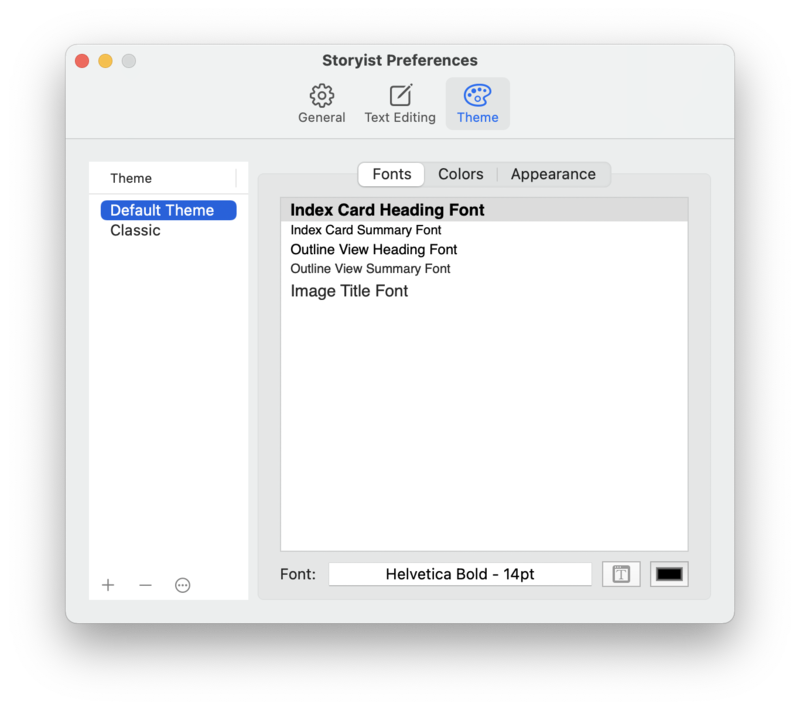 By default, Storyist represents characters and settings as images and all other items as index cards. You can change the representation of an item using the Action button in the control bar. Select the item(s) you want to change. Index Card—Displays the selected items as index cards. Image—Displays the selected items as an image. Image and Title—Displays the selected items as photographs. If the item does not have a photo associated with it, Storyist uses the default image for the item type. Icon and Title—Displays the selected items using the default icon representation. Comment—Displays the selected items as a comment. Select the index cards whose color you want to change. Click the Action button in the command bar in the Storyboard view, choose Color from the pop-up menu, then choose a color from the submenu. A Storyist project contains your manuscripts and scripts, and your story sheets for plot, character, and setting. It can also hold many types of ancillary information. For example, you might use it to store bits of dialog, clippings, research, or query letters. The Project View—located at the left of the main window—helps you organize and access these project items quickly. Via the File > New menu. Via the Add button in the toolbar. Via the Add (+) menu at the bottom of the Project view. Note: If an item is selected in the Project view when you add a new item, Storyist will add the new item after the selected item if possible. If nothing is selected in the Project view, Storyist will add new items to the default location for the item type. Tip: If you select an item in the project view and then click the Add button in the Project view while holding the Option key, a new item of the same type as the selected item is created. In addition to using the Project view to add project items to the project, you can use it to add outline elements (for example, chapters, sections, and scenes) to manuscript or script project items. Select a text outline item (manuscript or script) in the Project view. Click the Add button in the Project view. Select the outline element you want to add from the menu. Note: Storyist determines whether or not to display a text item’s outline in the Project view by examining the text file’s outline template. You can edit the outline template by selecting the File Info pane in the inspector and clicking Edit Outline Template. You can enable or disable outlining for a text file, using the “Enable outlining for this file” checkbox in the File Info pane in the inspector. Also, the list of outline elements displayed in the menu is generated from the outline template. Select the items you want to delete in the Project View. Click the Action (gear) button in the control bar at the bottom of the Project View. The items you selected are moved to the project Trash. To view the contents of the project trash, click the View button in the toolbar and choose Show Project Trash. To Empty the Project Trash, click the Empty button at the top of the trash list. Be careful with this. You can’t undo this operation. Storyist provides default settings for project items, but you can edit the settings to specify things like editor behavior and preferred contents of a particular folder. To edit the preferences for a project item, open the inspector and select the File Info pane. The file name and icon appear at the top. Additional preferences are displayed according to the type of item selected. These preferences are detailed below. Screenplay—Used for screenplays and stage plays. When selected, this mode enables context-sensitive completion of screenplay elements like scene intros, locations, times, characters, extensions, and transitions. If you choose Screenplay mode, you can edit the available completions by clicking the Edit Completions button. Text File—Used for novels, short stories, and other prose. Context-sensitive completion of screenplay elements is disabled, but the standard completions (invoked using the ESC key) are still available. Enable outlining for this file—Clicking this checkbox causes the file’s outline elements (that is, the chapters and sections or scenes that make up the file) to appear in the Project and Outline views. This checkbox is checked by default for manuscripts and scripts but is disabled for notebook entries. Include body text elements—Clicking this checkbox causes the file’s body text sections to appear in the outline. This checkbox is checked by default for manuscripts and scripts but is disabled for others. Edit Outline Template—Clicking this button brings up a dialog that lets you edit the outline template (level labels and styles) for the file. Create sheets automatically—Clicking this causes Storyist to create a section or scene sheet when new sections or scenes are created. Shortcuts—You can specify whether or not Storyist enables Tab and Return shortcut processing in the file. 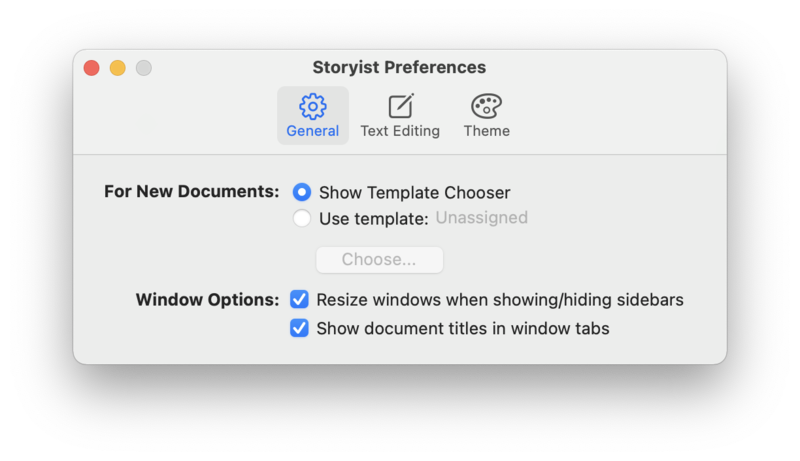 If you choose “Use the application preferences,” Storyist will use the settings you specify in the application preferences (accessed from the Storyist > Preferences window). Contents—Specifies the preferred contents for the folder. 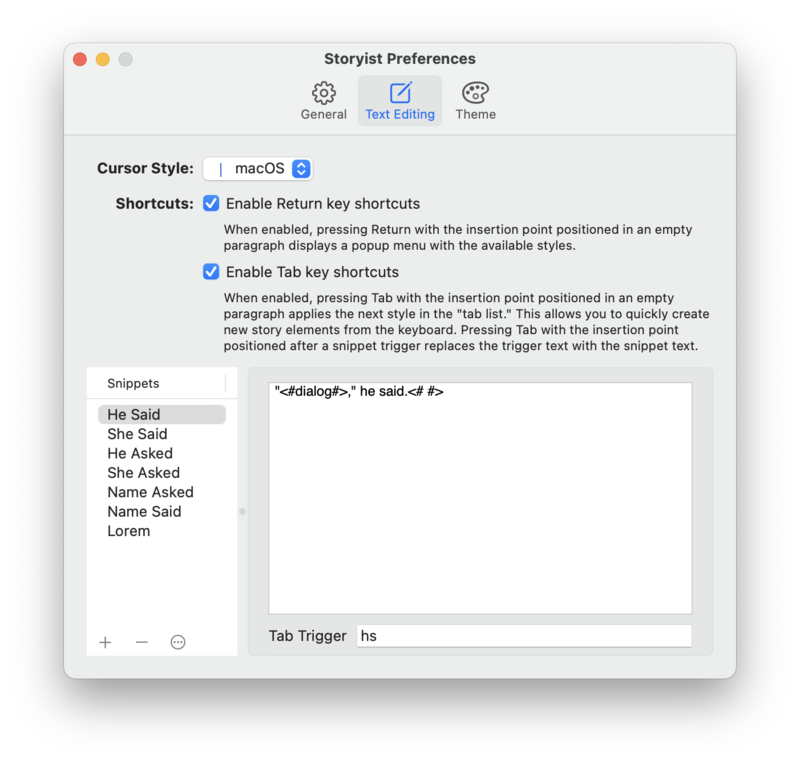 Storyist uses this value to provide keyboard shortcuts (Command-Return and Command-Slash) for the Project view and Outline view, and to decide where to put new files if nothing is selected in the Project view. Note: Preferences for some kinds of project items are not available. For these items, choosing Edit simply displays a dialog showing the item title and kind. One of the benefits of having all your project-related writing in one place is that the contents are instantly searchable. Click in the Search field at the top of the Project view. Your search results appear in the Project view. To navigate to the file or story element that contains the search text, simply click a search result. When you’re writing, you probably want to arrange your windows and views to focus on the manuscript or screenplay. When you’re outlining, you likely want to use the Outline view. When you’re revising, you may want to see the manuscript and screenplay along with your notes. It can be cumbersome to size your views and configure the display preferences to suit your needs, so Storyist provides the ability to create workspace snapshots to quickly recall your settings. You can split a view horizontally or vertically. Storyist even lets you nest split views, so you can create quite complex view arrangements. View > Split > Split Active View Horizontally. The active view is split so that the views are stacked one on top of the other. View > Split > Split Active View Vertically. The active view is split so that the views are arranged side by side. To close the active split view, choose View > Split > Close Active Split View. To close all split views but the currently active view, choose View > Split > Close Others. Sometimes it is useful to have multiple project windows open. Not only can you see multiple project documents at one time, but you can also take advantage of Spaces to streamline your workflow. To open a new project window. choose File > New > Window. When you have your windows and views arranged to your liking, you can take a snapshot for later recall. A list of open windows. The split view sizes and arrangement. Display setting for each view. Choose Window > Workspaces > New Workspace. The Workspaces window appears with a new workspace (titled “New Workspace”) enabled for renaming. Choose Window > Workspaces > Manage Workspaces. Click the Add (+) button. A new workspace appears. The Workspaces window lets you create, update, switch between, and delete workspaces. To view the Workspaces window, choose Window > Workspaces > Manage Workspaces. To add a workspace for the current project configuration, click the Add button. From time to time, you may want to update the image or settings for a workspace you use frequently. Click the Workspaces action (gear) button. Choose Update Workspace from the menu. 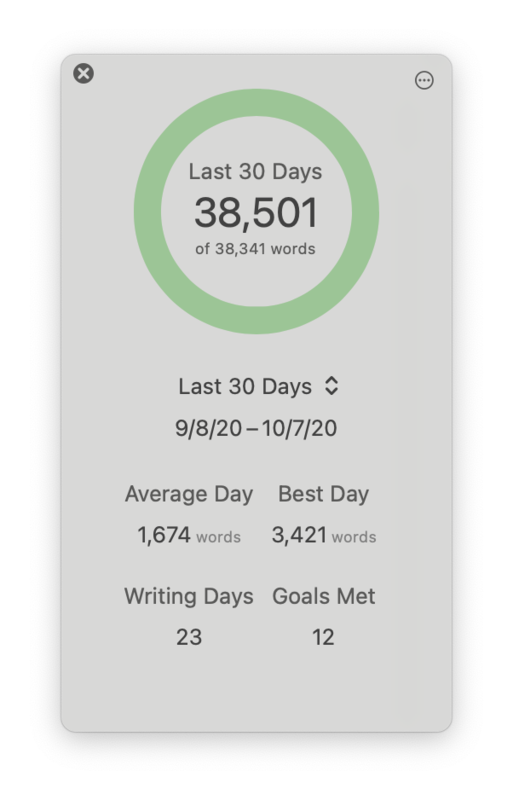 Storyist lets you set word count goals for both your daily writing sessions and your entire project, and helps you track your progress over time. Click the Goals button in the toolbar. If necessary, click the Action (gear) button in the Goals popover and choose Edit Goals. Enter a target word count for the project in the Project Goal field. 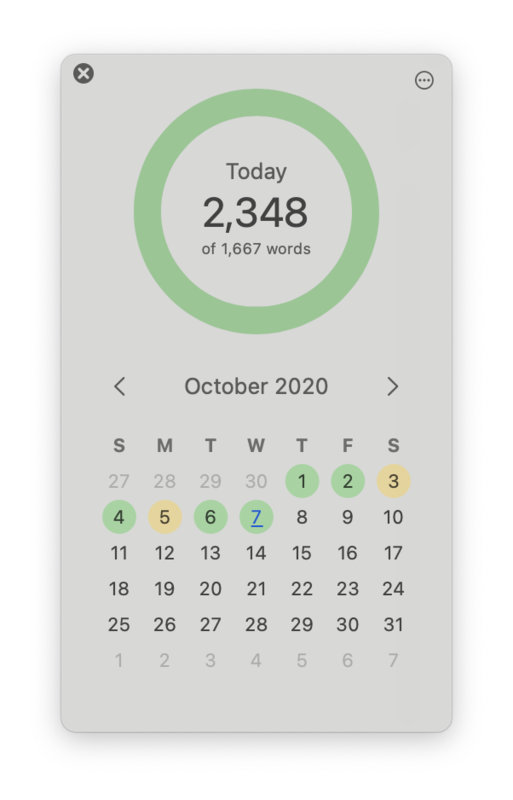 Enter a daily word count target in the Daily Goal field. Select the text file(s) you want to track. 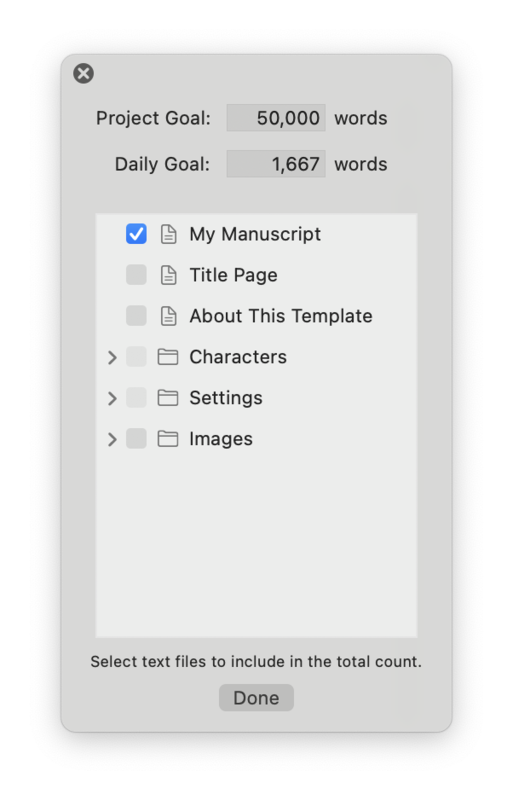 Note, you can also edit your word count goals by clicking on the Project item in the Project view and opening the File Info inspector. After you’ve set up your writing goals for the project, you can track your progress in several ways. The calendar view displays your word count progress in calendar form. Days on which you’ve achieved your goal are shown in green. Days on which you’ve achieved at least fifty percent of your goal are shown in yellow. Days on which you’ve written something, but achieved less than fifty percent of your goal are shown in red. To see the calendar view, click the Goals button in the toolbar, click the Action button, and choose Show Calendar. Alternately, you can click the first of three page buttons at the bottom of the Goals popover. You can browse results from earlier sessions by clicking on a date. Clicking on the left arrow shows the previous month. Clicking on the next arrow shows the following month. Clicking on the dot next to the left or right arrows resets the calendar to the current date. 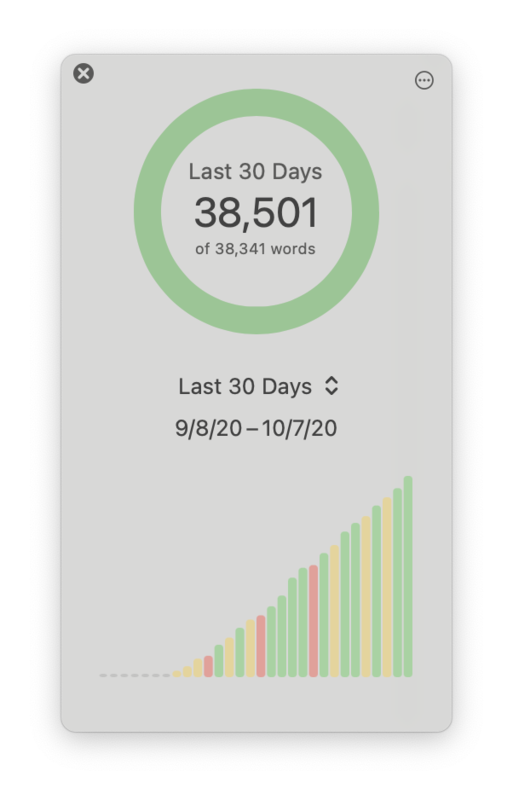 The graph view shows you a graph of your word count progress in graph form. You can choose the range of dates you want to see, and you can browse through past writing sessions using the arrow keys. To see the graph view, click the Goals button in the toolbar, click the Action button, and choose Show Graph. Alternately, you can click the second of three page buttons at the bottom of the Goals popover. The average number of words written each day. The number of words written on the best day. The number of days you’ve written something. The number of times you reached your goal. As with the graph view, you can choose the range of dates you want to see. To see the summary view, click the Goals button in the toolbar, click the Action button, and choose Show Summary. Alternately, you can click the third of three page buttons at the bottom of the Goals popover. You can also configure the Status Bar to show both your total project word count and your progress toward that goal. Choose View > Customize Status Bar. A customization window appears, allowing you to select which items you want to be visible in the status view. Note: Option+Clicking on the Status Bar also causes this customization window to appear. Click the location in the Status Bars in the customization window that you want to change. A pop-up menu containing the customization choices appear. Choose Project Progress to show a progress bar that indicates how close you are to your goal. Choose Project Word Count to show the total number of words you’ve written. When your manuscript is complete, you can create print-ready PDFs to send to a professional book printing service like Blurb. Create a new “Book” project item from one of the included templates. 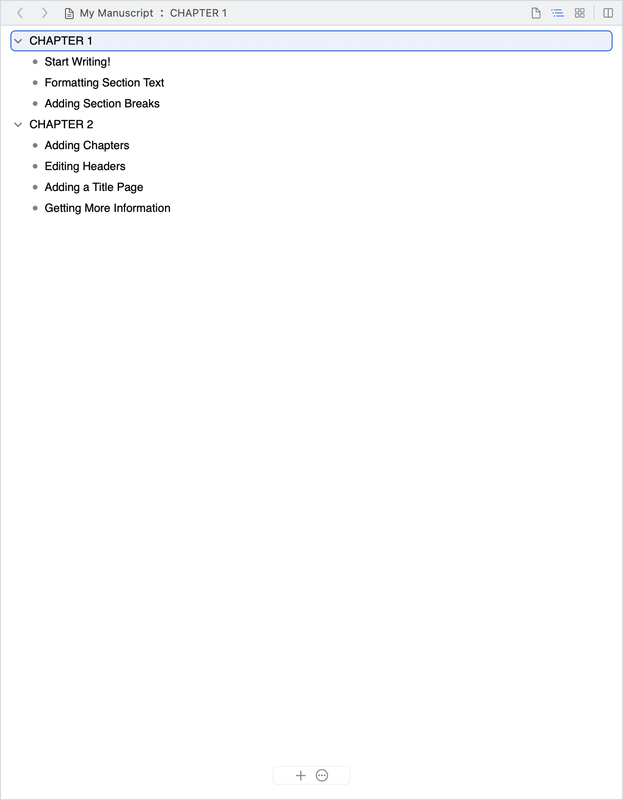 Add the text files for your chapters and sections to the book body. Add front and back matter (for example, a title page, table of contents, and copyright page). Adjust the page size and layout to your desired settings. Select a template for your book. The built-in templates provide a starting point for further customization, and include beautifully designed style sheets and default settings for page size and bleed. PDF Edition–A general-purpose template, set in Baskerville, suitable for both fiction and nonfiction. Blurb Trade Book (Classic)–Set in Georgia, this template provides a classic design for novels and memoirs. The template conforms to the page size, margin, and bleed requirements for Blurb Trade Books. Blurb Trade Book (Modern)–Set in Helvetica, this template provides a modern design for general non-fiction. The template conforms to the page size, margin, and bleed requirements for Blurb Trade Books. Click the Add (+) button in the Files table in the book editor. Select files from the dialog that appears. You can also drag text files directly from the Project view. By default, Storyist assumes that the files you add from the project are part of the book text (not the front matter or back matter). 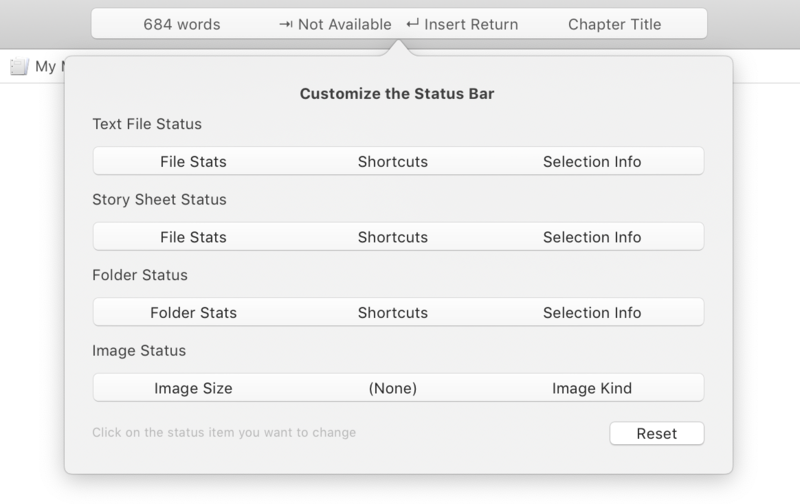 You can change the file’s role in the book by opening the Formatting inspector and setting the Role pop-up button to the appropriate value. Select the file in the Files table. Uncheck the “Include in table of contents” checkbox in the Formatting inspector. Storyist can automatically create and maintain a table of contents for your book. Select “Table of Contents” from the menu that appears. The page (trim) size of your book is often different than the size of your manuscript pages. Select your book in the project view. Open the File Info inspector. Select a size from the Page Size pop-up button. If you don’t see the size you’re interested in, choose “Other” and select one of the standard sizes. Select the book in the Project view. Enter the desired margins in the Margins pane. Note: The margins and header/footer settings apply to the entire book. If you’re creating a book for print, check the Mirror Pages checkbox. This will change the Left and Right margin labels to Outside and Inside. Make sure that you allow a wide enough margin on the inside of the page spread that the text on your pages doesn’t disappear into the binding. Book printers post minimum recommended margins on their websites. On a press, pages are printed on paper that is slightly larger than needed and then trimmed down to size the final page (or trim) size. Bleed is printing that goes beyond the edge of where the sheet will be trimmed. Book printers post minimum required bleed settings on their websites too. Enter the desired bleed in the Bleed pane. As with margins, if you’re printing a book, you can check the “Mirror Pages” checkbox so that the left and right bleed settings instead specify the outside/inside values. You can view the margin and bleed boxes using the View > Layout > Show Page Guides command. Each book template comes with a style sheet that specifies the look of the headers, footers, headings and body text for the book. If the “Apply formatting from template” checkbox (located in the Styles pane in the Formatting inspector) is checked when you build the book, Storyist will reformat your source (project) files with the style sheet from the template. You can control which source styles are mapped to which template styles using the table in the Styles pane. The “Styles in Use” column lists the styles that are currently used in your source file. The “Replacement” column lists the styles from the template that will be used instead. Click on a style in the replacement column to see the list of available template styles. Note: The formatting of the source file remains unchanged. The changes appear only in the book. If you’d prefer to specify the formatting yourself, leave the “Apply formatting from template” checkbox unchecked and make the formatting changes in the source file instead. The Layout & Substitutions pane in the Formatting inspector lets you perform some common textual substitutions when building the book. Hyphenate text–Check this box to hyphenate words at the end of a line to give a more pleasing layout. Convert to typographers quotes–Check this box to convert from straight quote to typographer’s (curly) quotes. Convert to em dashes–Check this box to convert from two adjacent hyphens to an em dash. Remove first paragraph indent–Book designers commonly set the first paragraph after a heading flush to the left margin. Checking this box causes this to happen during the book building process. Replace Section Separators–Check this box to replace the section separators in the manuscript (the “#” character) with a different separator. The Pagination pane in the Formatting inspector lets you control the starting page and starting page number of the selected file(s). Next Page–Causes the selected file to begin on the next available page. Odd Page–Causes the file to begin on the next odd (recto) page. In many books, chapters start on an odd page. Even Page–Causes the file to begin on the next even (verso) page. The page numbering radio buttons let you restart the page numbering for the selected file at a particular value. It’s customary for the book body text to start at page 1, even though the title page and table of contents pages precede the book body. Choose the “Continue Page Numbering” radio button to cause the selected file to number pages continue the numbering from the previous file. Choose the “Start numbering at” radio button to restart the page numbering at a specific value. You can enter the desired page number in the adjacent text field. The book editor shows a preview of the PDF that will be created when you export your book. You can update the preview after you make changes to the contents or formatting by clicking the “Build PDF” button in the File table. At some point, you might want to fine tune the formatting that the PDF template applies to your text. For simple edits (for example, adding bold or italics), you can simply modify the content in the source file and click Rebuild PDF. For more advanced edits, you can import an editable version of the PDF to your project and edit that file instead. Open your book in the book editor and choose Advanced > Import Intermediate Files to Project from the Action (gear) menu in the Files table. This command will import the book’s intermediate PDF files as formatted text files that you can then edit. Adjust the imported files as desired. Replace the original files in the Files table with your adjusted files. Uncheck the “Apply formatting from template” checkbox in the Formatting inspector. When you’re happy with the preview of the book, click the Action (gear) button in the File table and choose Export. You’ll be prompted for a location to save the exported PDF. You can also export the PDF using the export interface. To use this method, choose File > Export, select the book item, and click Next. Storyist automatically saves a copy of your work every few minutes to help minimize data loss in case of power failure or other unforeseen circumstances. 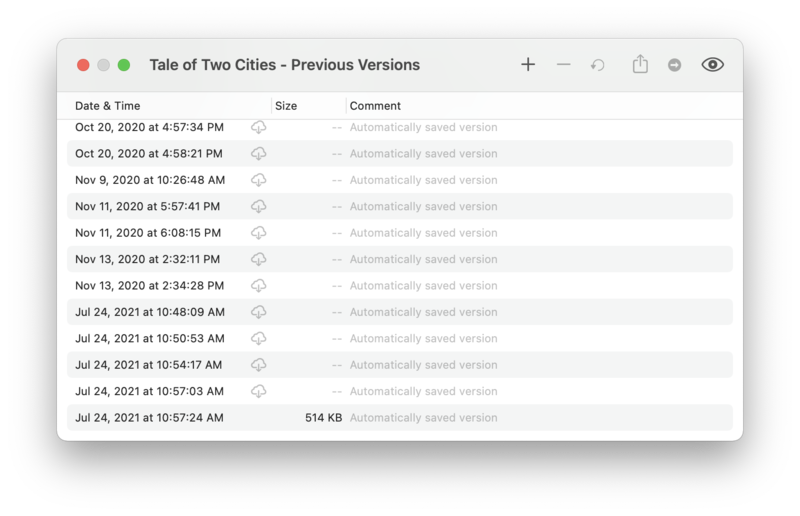 If Storyist should quit unexpectedly, it will restore your project from the automatically saved copy the next time you launch the application. For newly created projects, Storyist saves your changes in a temporary location on your hard disk. After you save your new project to its permanent location, Storyist continues automatically saving your work to the location you’ve chosen. Storyist also begins making periodic copies of your entire project. These copies are referred to as versions. Versions are created each time you open a project and every hour while you’re working on it. Open the project whose previous versions you want to view. Choose File > Revert To > Browse All Versions. Click the timeline on the right to move forward and backward in the version history. The Versions Browser is integrated with Apple’s Time Machine backup software, so if you set up Time Machine, you’ll be able to browse versions that are saved not only on your local machine but on your Time Machine hard drive as well. To make efficient use of space, macOS periodically prunes the automatically created version of a project on your hard drive, keeping hourly versions for a day, daily versions for a month, and weekly versions for all previous months. macOS does not prune any versions you create manually (see below). Note: If you prefer to see a simple list of previous versions, you can use the File > Show Previous Versions command. You can also save a version of your work manually. You might choose to do this after completing a draft, before starting a round of revisions, or before trying a scene you are not sure you’re going to keep. Choose File > Save a Version. A dialog appears. Enter a comment to help you identify this version. Choose File > Show Previous Versions. The versions list appears. Click the Save a Version button. Open the Versions Browser as described above. Locate the revision you want to restore. Choose File > Show Previous Versions. Select the version you want, and click Restore Version. The project now contains the contents of the previous version of your project. Storyist can export project files as individual files, or it can combine them and export them as a single book. Choose File > Export. The Export dialog appears. Select the project files you want to export. Choose “Files” from the Export pop-up button. Choose the desired export format from the Format pop-up button. Click the Next button and follow the steps for the export type you selected. Rich Text Format (.rtf)—Storyist exports text, formatting information, headers, footers, and style sheets. Use this format if possible. Rich Text with Attachments(.rtfd)—Storyist exports text, images, and formatting information. Microsoft Word (.doc)—Storyist exports text and formatting information. Microsoft Word (.docx)—Storyist exports text and formatting information. Open Document Text (.odt)—Storyist exports text and formatting information. HTML (.html)—Storyist exports text and formatting information. Text Only (.txt)—Storyist exports text information. 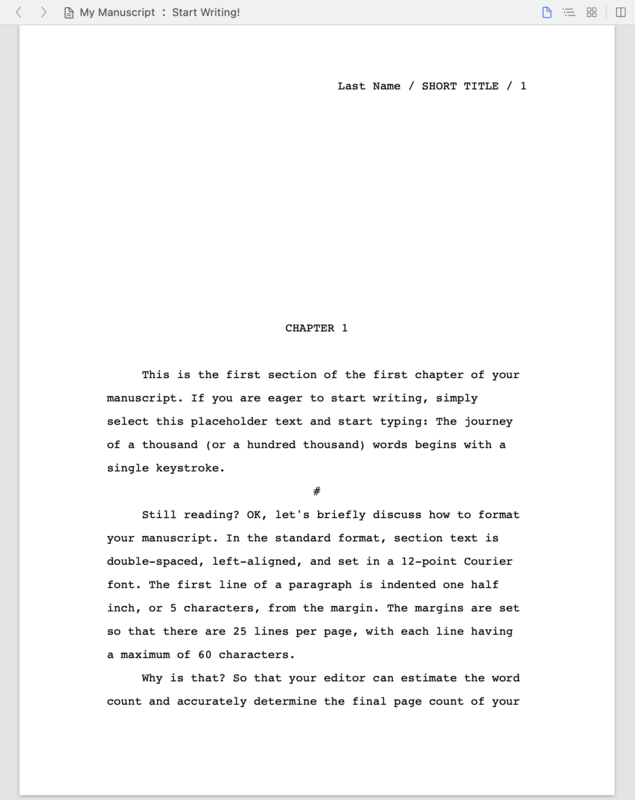 Final Draft Converter Format (.fcf)—This format is used by Final Draft, a screenplay formatter published by Final Draft, Inc. Storyist exports text and screenplay element information. Final Draft XML Format (.fdx)—This is the default file format for Final Draft version 8. Storyist exports script text, script notes, and screenplay element information. Scrivener Format (.scriv)—Storyist exports formatted text, comments, and index card data as a Scrivener project. Fountain (.fountain)—Storyist exports plain text that follows the Fountain markup guidelines. Note: Images are exported in their native format. That is, they are exported in the format they were in when added to the project. When you click the Next button in the export dialog, Storyist presents the Save dialog. Choose a location for the exported files and click Export. Choose “Book” from the Export pop-up button. Click the Next button to begin the export workflow. Exporting an ePub or Kindle Book. Step 1 of 2: Arrange files in the order they should appear in the book. Step 2 of 2: Enter publication information. If you’re not sure which roles to use, choose “Cover” for the cover image, and “Book Body” for everything else. Title—The title of the book as it appears on the cover. Author—The primary creator of the book. If there is more than one author, enter additional names in the metadata table as described below. Description—A short summary of the book’s contents. Publisher—The entity responsible for making the book available. Author—A primary creator of the book. ISBN—The International Standard Book Number that uniquely identifies the book. The ISBN is usually provided by the publisher at the time of publication for sale. Type—The genre of the book, (romance, mystery, and so on). Format—The media type of the book. Language—The language of the book. Rights—The copyright notice and other description of the rights reserved. Note: These metadata terms correspond to those specified by the Dublin Core® Metadata Initiative. See http://dublincore.org for more information. Step 1 of 2: Arrange files in book order and select page numbering options. Using the arrow buttons or drag and drop, arrange the files in the Files list in the order they should appear in the book. Then, for each file, select the desired page number and table of contents settings. Include in table of contents—Choose whether or not the headings in the file appear in the digital table of contents that is generated for the book. Start On—Choose whether the file starts on the next available page, the next odd page, or the next even page. Finally, Choose whether the page numbering for the file starts on the next page number, or restarts at some other number. It is customary, for example, for the first page in the book body after the front matter to restart at page one. Note: You can select multiple files to set the values at once. Subject—The subject of the book. Keywords—A list of keywords that describe the book contents. After you’ve selected the items you want to export and entered the export setting information, you can save your item selection and settings as a preset to use the next time you use the export command. Click the Presets pop-up button at the bottom of the Export dialog and choose “Save as Preset.” A new dialog appears. Click the Presets pop-up button. Select the preset from the list that appears.